Atresia means "not formed" - in this situation applying to the ear canal. Microtia and or atresia occur in one in every several thousand births. Up to 20 children or so are born with this in New Zealand every year. It is relatively common in New Zealanders, and also in some other populations, such as the Japanese and the Navajo Indians. In New Zealand, Microtia/ Atresia occurs 3-4 times more commonly in children with Maori or Pacific Island Heritage. We have assessed more than 250 children with Microtia/ Atresia at the Microtia/ Atresia clinic, held at Starship Children's Hospital. Microtia may occur as an isolated deformity although in 50% of those affected, other anomalies may occur as well. Most , but not all people with microtia also lack an external auditory canal. This is known as "atresia" of the ear canal. Atresia may occur in some cases, without microtia. Microtia is known to occur as part of a spectrum of syndromes, especially hemifacial microsomia, Goldenhar syndrome and Treacher-Collins syndrome. These syndromes typically involve some under development of part of the facial struture and/or jaw. What are the causes of microtia Atresia? Decreased blood supply to the developing ear while the baby is developing in the womb. Medication taken by the mother during pregnancy such as Accutane, Thalidomide and retinoic acid. Genetic factors: sometimes there is more than one family member with microtia or atresia. At present, it is not often we are able to define for sure the cause of an individual child's ear anomaly. Why couldn't we see this on antenatal ultrasound? Although many anatomic abnormalities may be identified on the ultrasound, it is difficult to fully evaluate the external ear. In addition, most ultrasound technicians and physicians are concentrating on organs such as the heart and kidneys, rather than the ears. Although the possibility of permanent "nerve" hearing loss is present, most children with microtia/atresia have a relatively normal inner ear. However,the middle ear and hearing bones are usually underformed/deformed to some degree, or may be absent and this results in a "conductive" loss of hearing on the affected side. This means that while the inner ear on the affected side could still function, it is not able to function properly because sound is not delivered to it though a normal ear canal, ear drum and hearing bones. Children with single sided (unilateral) atresia and microtia usually have normal hearing ear on the other side. This is usually sufficient hearing for normal or nearly normal speech and language development to occur. Children with unilateral involvement usually cope quite well listening at home, when it is quiet. We do know that children with one sided hearing loss find it a lot harder to hear at school. Many studies have shown that these children find it harder to reach their full potential, however, it is quite possible also for a few children with single sided hearing loss to do well at school without any additional assistance. When both ears are involved, there will not be sufficient hearing for speech and language to occur. The majority of children with microtia/atresia have inner ears that function normally. The problem that they face is getting sound from the outside world into their inner ears. Hearing tests chosen to assess this depend on the ages and stage of development of the child, and of their co operation. ABR (Auditory Brainstem Response) measures tiny brainwaves which are the response to a sound provided by headphones. This test is usually performed with babies while they sleep. For most babies these days, this test is done as part of the neonatal hearing screening process. Children who have abnormally shaped ears are usually referred by the neonatal hearing screening programme directly to an audiologist or audiology department. An ABR test is then performed by a senior audiologist. "Behavioural testing" is performed on children over the age of 6 months. This involves the child playing in a sound proof room , where their responses to calibrated sound is assessed. Any bilateral hearing deficit should be treated with hearing aids. 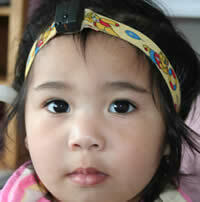 A head band type aid is recommended for all young children from the age of 6+ weeks. Headband aids are available which may have an aid fitted for both the left and right ears. We now recommend a BAHA headband style hearing aid ( or an equivalent bone conducting hearing aid on a headband) be fitted for children (from 6 weeks of age) who have a unilateral hearing loss. There is good evidence that this might help the hearing nerves and hearing centres in the brain develop more normally, and that this might also help with speech and language development too. It is likely to help with the development of more normal direction sense abilities and with the ability to hear better in background noise. An "FM" system should be fitted for the class (pre- school and school) for all children with hearing loss . An FM system allows the teacher's voice to be carried from a small lapel or "Madonna" style microphone to speakers placed strategically in the room, or directly to the child's hearing aids. This is an opearation which may be offered for some children with bilateral atresia and who have suitable partial formation of the middle ear. In some children/adults with unilateral atresia and very favourable middle configurations-this may be possible too. An external ear "pinna" reconstruction would be required prior to external ear canal reconstruction. If ear canal surgery is an option, we recommend it be done after the first stage of the external ear reconstruction and before the second stage. The MedEl Bonebridge is now available for children over 5 years who have suitably favourable anatomy on CT scanning. The Med El Soundbridge is also a treatmnent option for some children as young as two years of age. These are two part devices, with an implant under the skin inserted behind the ear during a short operative procedure, and a small, round button shaped external aid which sits in the hair over the top of the internal device. They are held closely together by magnets. Unlike the BAHA device (mentioned below), there is no implant passing through the skin, and therefore there is much less long term maintenance required. People who use these devices are able to swim and shower normally, but must remember to take the external aid off before doing so (just like you should take your glasses off before showering!) 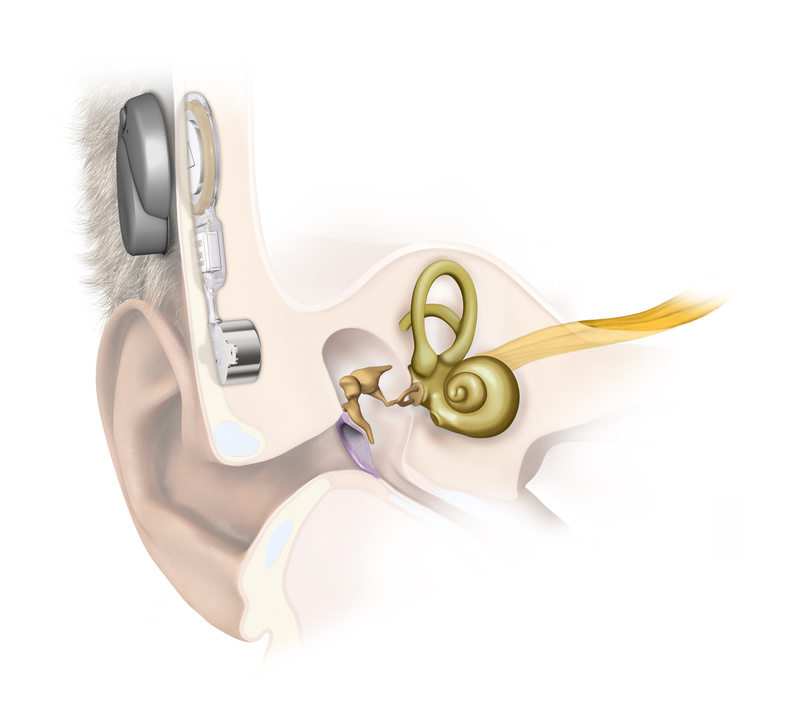 These devices are capable of an excellent level of hearing restoration. 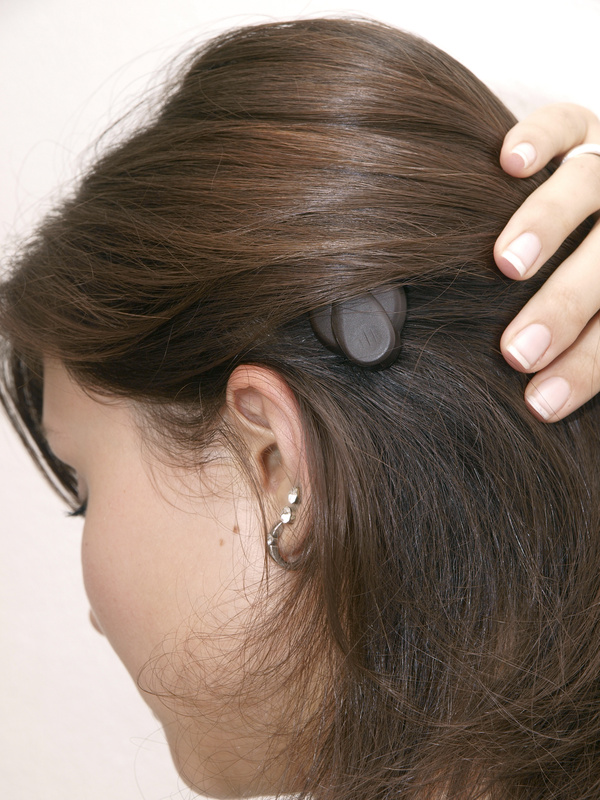 The bone anchored hearing devices are capable of restoring excellent hearing quality. We now prefer these as an option in older children- 15 years and above. A tiny titanium stud is inserted through the skin behind the ear, into the bone of the skull, during a short operative procedure under general anaesthetic. We have used many of these devices in young children, with positive reports from parents, but our research has also shown, that for reasons which are not entirely clear, that in New Zealand North Island children, there is a high risk of infections in the skin around the implants. This has necessitated frequent use of antibiotic creams and small surgical procedures to settle the infections. Older children and adults seem to be at far less risk of skin infections. If surgery is not being considered for your child, a CT scan is not essential unless there is a tiny ear canal (sometimes called a "pin hole" ear canal) still present. In this situation, there is a small risk of skin cell build up in the tiny ear canal, forming a condition called "cholesteatoma" which may be quite destructive and damaging to the rest of the inside of the ear. For children with tiny ear canals, I recommend a CT scan at the age of 3 1/2. If surgery of the ear canal is contemplated, a CT scan is performed. This usually takes a few minutes to do. Sometimes the scan will hlep plan what type of external ear reconstruction might be preferable. The most important advice I can give you about this is to ensure that the surgeon performing ear reconstruction for you or your child is experienced, has a good track record of ear reconstructions, can show you results of surgery they have personally performed and that they work as part of a multidiscplinary Microtia/ Atresia team. External ear reconstruction requires two but sometimes more surgical stages. Several months at least are required between stages. The essentials are that rib cartilage is used to create a framework for the new ear. The framework is inserted under the skin in its new site on the side of the head. The ribs are not big enough to do this until approximately age 10- depending on the build of the child. The rib framework once inserted under the skin is later "elevated" at the second procedure so that it projects out more normally.Surgically created ears can look quite natural and seem to be well liked by the children who have them- although it is not possible to create an ear which is "perfect." Medpor is a plastic polymer material which looks like a firm type of sculpted foam. This may be used for external ear reconstruction for some children. Like the rib cartilage option, medpor is inserted under the body's natural tissues. Surgery with medpor is a littel quicker than using rib, and there is no chest wall or rib pain, however, Medpor may not be quite as tolerant to trauma as rib cartilage, so at present, we recommend this mainly for children with both ears affected (to minimise the numder of operations they might need). It is possible to perform ear canal reconstruction prior to a medpor external ear reconstruction, but it is not possible to perform ear canal reconstruction after a medpor external ear has been placed. Sometimes it is possible to perform a medpor ear reconstruction in much younger children, although it is not certain that this will suit most children or adults in the New Zealand situation. Although having a child born with microtia/atresia is a traumatic experience, it is important to also see things in a positive light. Unfortunately, there are many children born with life-threatening illnesses and anatomic abnormalities. Microtia/atresia in itself is a relatively benign condition and should be treated as so. This is a difficult concept to accept when one has a child with microtia/atresia. It takes time! As long as there are not other severe associated abnormalities, these children live a relatively normal life and are able to fulfil their potential. I see most of the children born with this condition at a combined "Microtia/ Atresia" clinic at Starship Children's Hospital, which is held currently 5 times per year, in association with Mr Glenn Bartlett, Specialist Plastic Surgeon (and experienced microtia surgeon). His website is www.earsurgery.co.nz. I am also very happy to see children or adults with this condition at my private office at Gillies Clinic.